Why do I never see this item on anyone's bug-out/get-home/go bag list? Seriously! I don't recall seeing it on any list whatsoever in my recent memory! I may very well be wrong, unobservant or I simply haven't seen enough lists lately. 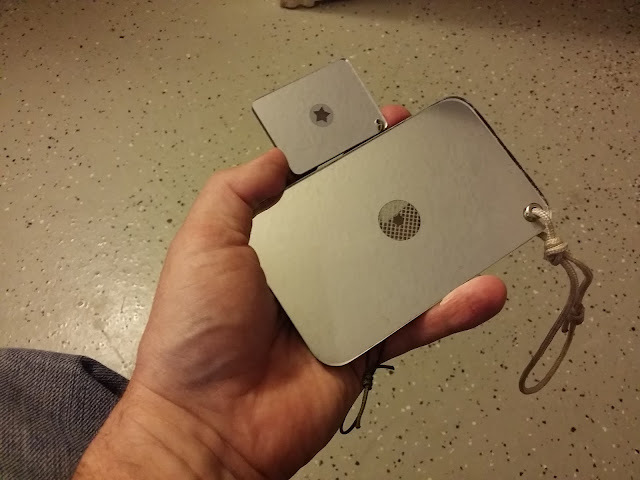 When I was a Boy Scout a signal mirror was one item that I never went hiking or camping without. One of the few scouting projects I actually do remember was making a signal mirror. Where that mirror is now I haven't the slightest idea. I really wish I did. It went with me everywhere. In this pictures you see two mirrors. The small one is made of plastic and the larger is glass. The plastic one will not break nearly as easily as the glass mirror but there are disadvantages with plastic. It scratches a lot easier, which will make it less reflective, and the reflection is not as bright or crisp as with the glass mirror. Yes, a plastic mirror of the same size is significantly lighter. These tiny Lexan or plastic signal mirrors are very cool. They ensure that you can quite literally always have one with you as they come is various sizes. Size is everything with a signal mirror. The larger the better, the easier to use and further the signal can be seen, especially under low(er) light conditions. Even on an overcast or hazy day a signal mirror can be an effective signaling device. I bet you're still pondering why you should add a signal mirror to your EDC gear. First of all, to me, EDC does not just mean what I have on my person. It is anything I carry with me every day and could be part of the gear in my vehicle. 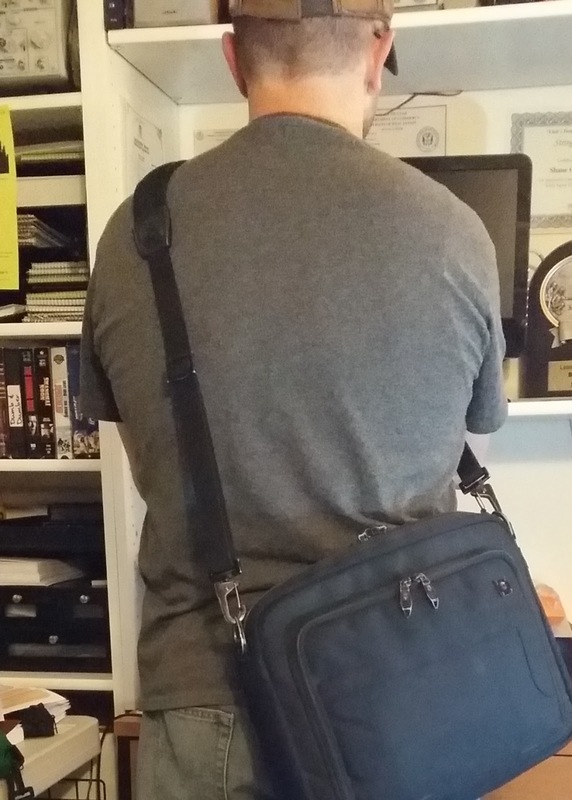 For my work I carry a business bag. In it I carry more EDC stuff than work stuff. It is a quality Victorinox shoulder bag that looks like a work bag; not a tactical bag that could attract attention. I'm not gonna carry a glass mirror in my pocket BTW. Other than the obvious use of being able to signal for rescue in a dire circumstance a signal mirror can serve many other valuable purposes. You can use a mirror to look around corners or over the top of solid objects like a desk without being noticed or exposing yourself to attack in an active shooter or other tactical scenario. Working in a group or team efficiently over distances requires communication. Use a signal mirror to send Morse code in complete silence to other team members or as a pre-determined sign to coordinate efforts. Signaling at night under a full moon is also possible however more difficult. Place a mirror in a tactical location so that you can watch your own back or where it will give you an additional viewing angle around obstacles. Use the power of sunlight to distract and/or temporarily blind an attacker... or rooftop sniper. Direct sunlight into a dark place with far greater power than a flashlight. Deflect an incoming laser beam from an enemy satellite. Use it to apply your Camouflage face paint. Of course a mirror can also give away your location to others if they are as perceptive as you. So, use caution and good judgment and, yes, practice. Know how to use a signal mirror and become familiar with and be able to quickly reference what the incidence angle is between the sun and your subject. Practice will help you to make angle determinations quickly and accurately, which mistakes might otherwise give away your position. Do you have any other suggested uses of a signal mirror? Please feel free to leave a comment. That's why i love ecd items. Thanks for show your wonderful views around,,i am really bags pleased to be here. Thanks for spending some of your valuable time here!